Zimerman: A Piece of Land or Peace on the Land: How Much Is a Peasant's Life Worth in Brazil? A Piece of Land or Peace on the Land: How Much Is a Peasant's Life Worth in Brazil? Abstract: Land inequality in Brazil is alarming and several poor individuals living in rural areas do not have enough income to survive decently. The struggle to access land should lead to a paradigm shift with social movements leading this process since democratization. Their strategies vary, but usually focus on complementary activities of mass mobilization that culminate in the occupation of unproductive land that is not fulfilling its social function in order to force expropriation and the creation of new settlements. This study aims to investigate, through empirical evidence, if such strategies are having the desired effect of allowing the poor to access land, without increasing the already high numbers, and potentially aggravating the violent characteristics, of such disputes. 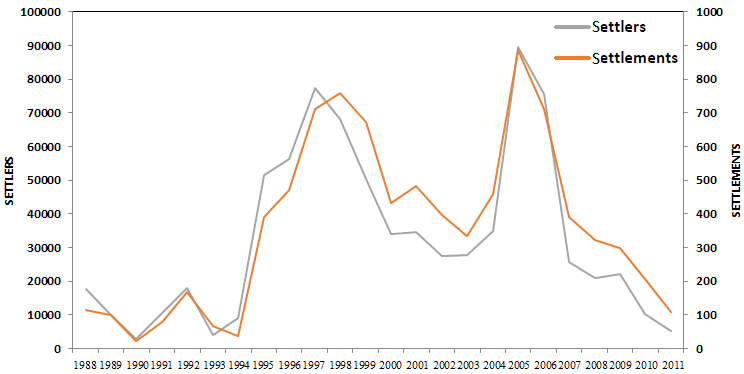 During the Cardoso and Lula presidential administrations the relation between the number of new settlements and the number of deaths caused by land disputes increased. However, there is still a long way to go to improve this policy and achieve positive results. Overall, is this struggle for the reduction of inequality in the Brazilian countryside being won? Is the sacrifice paying off? And what is the price regarding the relation between land conflict victims and the creation of new rural settlements? Brazil has vast dimensions, fertile land and climate conditions that are favorable for agricultural activity. Hence, in 2012, the country ranked third among the world’s largest exporters of agricultural products ( p. 2) . Given these natural attributes, it is hard to conceive that this abundance would lead to violence caused by land disputes, since well-distributed land among the peasant population would contribute to rural inhabitants deriving their livelihoods from the land. The main problem is that the land is extremely unequally distributed: 1% of landowners occupy about 50% of arable lands , which is one of the highest rates of land concentration in the world. With the expansion of agribusiness and human and animal food crops being replaced by renewable energy crops, land concentration worldwide is growing, and tends to grow even more, in countries with a Brazilian or Latin American profile [3, 4]. Land in Brazil is an abundant natural resource though very unequally distributed and, as such, part of the existing literature discusses the association between abundant natural resources and violent conflicts, especially as a cause for civil wars [5, 6, 7, 8, 9, 10] and other episodes of violence. However, there are not many studies relating natural resources in general, and land in particular, to lower-intensity conflicts that also cause a great number of deaths, as well as forced displacement, arrests, injuries, threats and the like. In existing studies, the type of political regime is often included in models as one of the variables that can lead to the insurgency of collective violence; violent conflicts have a greater tendency to happen within anocratic  (or hybrid/intermediate) political regimes. These regimes are known for being a middle ground between a consolidated democracy and an autocracy, mixing democratic and autocratic elements in which the population does not have freedom and the heterogeneity of groups is not respected. On the extreme, civil and political liberties are violated and protests are strongly suppressed [12, 13, 14, 15]. Since democratization in 1985, due to the country’s abundance of natural resources, particularly land (the theme this study aims at addressing), and the very little time the country has had to strengthen its institutions, Brazil has gone through agrarian conflicts caused by the historically unequal distribution of land, which in turn produces poverty and misery in the countryside. About 1,500 people have died since the country’s democratic opening as a result of the struggle for land; the great majority of deaths occurring among the peasants or their supporters . This study aims to evaluate the cost of human lives that derives from land dispute conflicts in Brazil, analyzing if social movements and non-governmental organizations that mobilize the rural (and urban) population to fight for fairer land distribution, and consequently reduce poverty, achieve the desired effect. That is, if the means applied to acquire a plot of land for the poorer rural population is producing the practical outcome of a more equitable land division. For this purpose, a new database from DATALUTA will be examined on the different types of peasant mobilization, land appropriations and settlements implemented in Brazil between 1988 and 2011. 1988 marks the year of the new Federal Constitution. Article 186 of this most recent constitution requires proof that the land fulfills its social function and is not unproductive in order for it not to be destined to expropriation and distribution to very small owners or landless peasants. Data on agrarian violence will also be presented, with the aim of clarifying the number of people that have died in the struggle for land, the mobilization activities that third sector entities implement to keep this struggle alive, and the number of people that have been settled. In short, is this fight being won? Or furthermore: Is this fight paying off in terms of the ratio of victims of land conflicts to settlements created? One of the Brazilian military government’s goals in 1964 was to develop the country’s agriculture. Shortly after the military coup, during the military government’s first year, the Land Statute (Estatuto de Terra) was created. This document emerged with the purpose to reduce conflicts over land and to prevent communism from spreading across the country and, amid the Cold War, counted on support from the US, especially after it had ‘lost Cuba’ to the Soviet sphere of influence. One way to accomplish this was to facilitate credit and give vast areas of land to large companies that had no expertise in the field, since they were from the automotive industry, financial markets, and other fields unfamiliar to the agricultural sector . People raced to areas where they believed to be vast tracts of unowned land. At the time, the motto was “Land without men for men without land”. However, a great part of the area that seemed unoccupied had been donated or financed at very low interest rates to companies who did not cultivate the lands, especially in the Amazon region, in the northern part of the country. Rural workers arrived in search of land and occupied already owned areas. However, the region did not have the necessary infrastructure to transport agricultural products, and the newly arrived workers were vulnerable to several diseases. Many local elites forged and artificially aged documents by putting them in drawers full of crickets, which made papers appear old, as if the properties had been inherited long ago. They were also aided by registry offices and notaries in the region, who legitimized the fraud. This is known as land grabbing (or in Portuguese - grilagem de terra). A great part of the land disputes originated  from the high concentration of owned land occupied by squatters, and from conflict between plantation owners and smallholder farmers, since large tracts of land generally required expansion to meet the agribusiness model, a relatively modern phenomenon. The democratization process in Brazil began in 1985 with the downfall of the military regime and was consolidated in 1990, with the country’s first free and universal presidential elections. Concurrently, non-governmental organizations (NGOs) and the third sector were allowed to represent the different sectors of the population. Consequently, individuals and groups, particularly in the poorer segments that had no representation in parliament or in civil society as a whole, received assistance and were no longer suppressed. Citizenship was being built. Such organizations and social movements mobilized peasants in order to pressure government representatives to undertake a land reform that would decentralize land tenure. There was heavy opposition from groups of large landowners who wanted to preserve the status quo (the Ruralist Democratic Union, known by its Portuguese acronym as UDN). Such groups were well organized and exerted significant influence on congress. In 1987, the president of the UDN admitted his organization had bought 4,000 guns and had 70,000 firearms at the group’s disposal ( p. 30) for protection against occupation of the members’ private property. The agrarian issue is embroiled in violence because, on the one hand, peasants want to take over land that is supposedly owned by third parties or the State and, on the other, landowners (or presumed owners) try to protect their territory from occupants by hiring gunmen or the police. Meanwhile, the State withdraws itself by not defining a clear policy to appropriate land and redistributes it to the poor living in rural areas. This is of utter importance considering that three out of every four of the world’s poor live in rural areas ( p. 36). Agrarian reform should be no less than a social policy to combat poverty where it is mostly concentrated: in rural areas. By alleviating rural poverty, the country would strengthen itself. One of the main problems in Brazil is that the State lacks the capability to carry out a substantial agrarian reform. Moreover, pro-market considerations disregard productive land as land to be included in the reform ( p. 221). The agribusiness sector is very important for balancing accounts given that commodity exports are a major source of foreign currency for the country. As observed, even workers’ political representatives when in power, tend to support agribusiness at the expense of land reform, and Brazil is no exception. Land occupation and its retaliation is a unique process that must be understood as a practice based on political context and performed as collective action ( p. 169) from both sides: those who occupy the land and those who defend it from occupation. The difference between these two forces is that those who occupy do not do it to practice violence against third parties, in the direct sense of physically victimizing people. However, retaliation of these occupations is frequently performed with the intent to cause physical harm to the activists. There is also a legal problem. The occupation of unproductive land, as mentioned above, can be legally justified through the Constitution, and the defense of public property is in accordance with the Brazilian Civil Code. While the National Institute of Colonization and Agrarian Reform (INCRA) defends the peasants, justice courts often favor the owners. None of these institutions prevail over each other, thus, land dispute conflicts continue ( p. 137). The current model incentivizes both sides of the conflict to use violence, taking into consideration that one side has weapons at its disposal, while the other is formed by an unarmed and poor population willing to revert the long standing land inequality scenario that persists among these divergent actors. Land occupation is the strategy most commonly used by social movements and rural workers’ unions aiming greater opportunities for access to land. Landless workers and smallholder farmers with small areas of land for subsistence pressure the government through local NGOs to solve land conflicts and implement rural settlements ( p. 73). There is a sense of urgency for the State to intervene when a peasant group, affiliated to a rural social movement or union, occupies (or threatens to occupy) an area that is supposedly unproductive and belongs to another owner, so that violence does not get out of control. In this case, the area is evaluated to ensure it is unproductive (usually the peasant leadership has already done this to map the possible targets) and begin the expropriation process (usually through compensation), which can take months or even years, depending on procedural progress. During this time, the territory is referred to as a land occupation. Upon approval and completion of the process, the land becomes a settlement. Nonetheless, there are many problems entailed, such as lack of infrastructure, lack of housing, reduced financial loans, shortage of technical assistance, distance from towns, and susceptibility to diseases. The new settled owners receive their titles and formally own their plots, and can even sell them if they so desire. However, in such cases, they won’t be allowed to participate in a future land reform and this can generate conflicts within the social movements, since the fight for land is not aimed at obtaining financial gains, but survival and a life with dignity. ”Landowners and local authorities in the Brazilian countryside frequently respond to occupations with violent repression. Their action reflects the hybrid character of the Brazilian state, modern and rational in cities and at the federal level but, in many rural areas, still clientelistic and marked by nonlegitimate violence… [On the other hand], the action of the land occupiers, however, is legitimated by the claim of civil disobedience while the efforts to repress them cannot lay claim to legitimacy on that basis” ( p. 156). This duality that represents a contradiction between the city and rural areas, makes economic and political power decisive in the countryside, favoring large landholders and the agribusiness elite by employing State authorities and the use of violence, to the detriment of the most vulnerable rural worker and landless people. However, as a counterpoint, the police crackdown on the protests had the opposite effect than was intended, and ultimately increased the protests, forcing the State to lend a hand to farmers by expanding the agrarian reform. State violence serves the purposes of those interested in getting a piece of land through agrarian reform. This occurred in Brazil. The intensification of the protests in 1995 and 1996, followed by repression, created a situation in which it was possible for the population to put in practice collective action mechanisms and to include the issue of police violence and land reform in the agenda, pressing the Brazilian government to expedite and expand the scope of land distribution . The State’s violence probably favored the creation of more rural settlements. The question is to what extent does the cost in lives encourage the State to take action to implement the necessary policies? Due to all the issues involved in land acquisition through redistribution and agrarian reform, those waiting to receive a portion of land for subsistence end up spending a large amount of time intensely mobilized by the organizational structure. The aim is to pressure the various levels of government through different means, demonstrating the precarious situation and violence they are subjected to. The democratization process allowed for the creation of a large number of organizations and civil society movements, whose aim is to mobilize landless workers in order to occupy unproductive land across Brazil. According to data from DATALUTA [26, 27], to be explained ahead, there were 108 different associations active between 2000–2011 mobilizing people to, among other activities, occupy land (see Appendix). The vast majority of these movements are local (more than 70 per cent were found acting within just one out of the 27 different Brazilian states) and do not act nationally. However, there are a few organizations that are engaged in activities throughout the country and, at times, even acting internationally, aiding landless peasants from other countries in their fight for a plot of land . They often form partnerships in order to maximize their efforts to occupy land. Only a few social movements act nationwide, therefore, this paper will deal mainly with organized movements that are spread throughout Brazil. Because of our scope, it is mandatory to detail in brief how these main social movements were created, how they operate according to their own rules and the differences between them. The Rural Landless Workers Movement, known as MST (from the Portuguese acronym for Movimento dos Trabalhadores Rurais Sem Terra), was formed after the Catholic Church installed the Pastoral Land Commission, CPT (from the Portuguese acronym for Comissão Pastoral da Terra), during the military regime in 1975, to counteract a specific modernization policy which consisted in granting large tracts of land to the various companies from different economic sectors so that they could transform what was understood as a development lag into a very effective agricultural sector. After acting in conjunction with CPT for some time, the Movement gained autonomy and started to operate independently, although there were some areas in which they held similar interests and actions. The modernization of agriculture, as proposed by the government, ignored peasants and gave capitalist companies the main role in modernizing and developing Brazil’s countryside. CPT’s main task was to organize peasants’ movements that emerged during the military regime ( p. 10). The State’s oppression was directed against those social movements such as the MST, which was first organized in 1978 after occupying a farm in the state of Rio Grande do Sul, with 110 families . In time the MST expanded its objectives and included the restoration of the democratic rule in the country and the pursuit for representation in Congress - certainly an innovative path for dispossessed people in Brazil, who had never been politically represented. Within a decade, the movement had turned very popular among peasants and gained growing support from urban sectors as well, particularly in universities and other NGOs. Land occupations were adopted as the movement’s main form of action, but additional strategies for striving for a piece of land were also included in its operation. According to Fernandes , MST’s formation consisted of three different periods: Creation (1978–1985), mainly in the South and South-East of Brazil, occupying land from latifundia and large corporations; Consolidation (1985–1990) spreading across the country and building its organizational structure; and Institutionalization (1990s) when the movement intensified the peasantry’s resistance actions, dealing with a very repressive State apparatus while occupying land ( pp. 11–12). An additional difference between the members of the MST in relation to other movements of landless workers is their high quality of life, as demonstrated by a national spectrum research conducted by government bodies such as the Ministry of Agrarian Development (MDA) and INCRA. The reason is the MST’s organizational structure, in which its affiliates need to get involved and are expected to commit to participatory education that is run according to the Movement’s goals. The results of this national survey indicated that MST landless workers are considered to have a higher self-perceived social status in relation to other movements, taking into account social justice, racial democracy and humanitarian values . Despite its ideological education for its rural communities, the MST is also perceived as an organization that prepares and educates children and adults with the basic elements for being full citizens and that demands public services from the authorities. Certainly, these features help the Movement gain more support and to rank it as one of the largest in Latin America. The National Confederation of Agricultural Workers, CONTAG (Confederação Nacional dos Trabalhadores na Agricultura), was created in 1963 and is the official rural workers union . This form of rural unionism defined its actions, which are aimed at defending labor rights in various areas. It is a less ideological movement than the MST. Nonetheless, during the military period, the regime’s opposition, represented by other social movements saw CONTAG skeptically and NGOS criticized the Confederation at that time. The rural department of the Unified Worker’s Central, CUT (Central Única dos Trabalhadores), criticized CONTAG for being submissive, legalistic, and for not solving the problems of small farmers. Since its origin, CUT’s rural department stated its intention to form an alternative union, opposed to CONTAG, closer to the grassroots, less bureaucratic and more combative in defending the interests of farmers ( p. 4). Nevertheless, CUT and CONTAG joined forces in 1995, but split up in the late ’90s due to disagreements. Unlike the MST, which rents buses with hard fiberglass seats, CONTAG rented mostly luxury and double-decker buses with air conditioning that belong to tour companies. CONTAG rented eight large tents to receive the protesters. A security company was responsible for the organization of space and for watching the belongings of those who slept on site. The MST, when camping in the capital Brasilia, usually occupies public spaces with no lighting, toilets or sanitary conditions. As for CONTAG, it bought 24,000 bottles of mineral water at the opening of a protest and two big loads of soft drinks, which were distributed by a truck that followed the protest on the Promenade. The MST usually uses water-tank trucks. The MST offers protesters bread without butter in the morning and a warm lunch with rice, beans and low-quality meat while CONTAG provided a complete breakfast and barbecues with several types of meat and vegetables for lunch and dinner. Apart from these meals, CONTAG prepared a bag with three ham sandwiches for every protester. What is observed in both movements’ demonstrations is that the MST is opting for bolder actions, such as the invasion of public buildings, while CONTAG has given preference to marches and public events. Both movements, however, have the option for land invasions in common (5 October 2000) [34, 35]. Other differences besides those mentioned above, pertain to how the movements understand the role of modernization in agriculture. Even the Brazilian government during the military regime intended to modernize agriculture but with a completely different approach than that aspired by certain social movements such as the MST. While the military regime focused on the large capitalist conglomerates as central actors in this process of modernization, the MST had a more ideological and clear political view in this regard. Its objectives are to combat the commodification of land reform, fight agribusiness and transnational companies because these want to control seeds, production and agricultural trade, besides keeping workers in the field under labor conditions analogous to slavery and other forms of subordination. MST proposes that agriculture be focused on the domestic market, that it respect the environment and encourages the agricultural cooperation and autonomy of workers . Nevertheless, the two largest groups defending peasants (MST and CONTAG) have common goals such as (a) the expropriation of all land holdings belonging to foreign capital and banks; (b) the expropriation of land in which ‘modern slavery’ is used; (c) both strive for the demarcation of all the lands of indigenous and quilombo communities ; and (d) both have national penetration and their members are scattered around the country, unlike most regional agrarian movements. DATALUTA is a land-conflicts database containing national information on land occupation, rural settlements, socio-territorial organizations and land structure as of 1988. Categories such as socio-territorial movements, land structure and peasantry demonstrations were recently incorporated. The dataset was created by the Center for Studies, Research and Projects on Agrarian Reform (NERA) of the São Paulo State University (Universidade Estadual Paulista, UNESP) and it is part of a larger body, the DATALUTA Network, which seeks to undertake joint efforts by bringing together nine research groups from universities located in several states in Brazil, as follows: UNESP (São Paulo State), Universidade Federal de Uberlândia (Minas Gerais State), Universidade Estadual do Oeste do Paraná (Paraná State), Universidade Federal do Rio Grande do Sul (Rio Grande do Sul State), Universidade Federal de Mato Grosso (Mato Grosso State), Universidade Federal de Sergipe (Sergipe State), Universidade Federal do Espírito Santo (Espírito Santo State), Universidade Federal da Paraíba (Paraíba State), and Universidade Federal do Mato Grosso do Sul (Mato Grosso do Sul State). This network helps to obtain more accurate data on the agrarian issue. Thus, DATALUTA became a national and international reference for agrarian conflicts and has enabled research exchanges with other countries around the world . The researchers that contribute to the dataset give consultancy to social movements such as MST and CPT, among others. Nonetheless, it is yet not widely known by scholars abroad at this stage. However, there are few sources of trustful data in this area and they all present deficiencies. DATALUTA is no exception, but it is improving constantly and seems to present more advantages than methodological problems. Figure shows relevant information about Dataluta in its various dimensions, from scale-level data, categories included in this database, and the sources consulted for its creation. Figure 1. DATALUTA scales and categories. Source: , p.10. Data on land occupation, demonstrations and socio-territorial movements are collected through secondary research in various journals and academic and non-academic institutions in states where the DATALUTA network’s research groups are located. When needed, field research is carried out to better understand different realities. Data is gathered from different sources, confronted and systematized through DATALUTA reports. DATALUTA’s methodology consists of systematizing data from primary and secondary sources and organizing it on different scales: municipal, micro-regional, state, macro-regional and national levels. Reports in DATALUTA work with land occupation (since 1988), rural settlements (from 1979), socio-territorial movements (since 2000), land structure (for the years 1998, 2003, 2010, 2011 and 2012) and demonstrations (since 2000). Data regarding land occupation, families and socio-territorial movements are organized from the following sources: CPT, National Agrarian Ombudsman (OAN; 2004–2009) and the data collected from national and regional journals by the network’s research groups. Data from rural settlements are extracted from INCRA and confronted annually with the Land Institute of the State of São Paulo (ITESP) and the National Association of State Land Bodies (Anoter Foundation). As Brazilian universities and institutions are not well known for collecting data, not much could be found on the subject. CPT is an exception that contributes annually with reports  regarding land conflicts in Brazil since the 1970s. Besides CPT and DATALUTA, no major or trustful datasets about the issue were released for empirical research; therefore, more efforts for collecting and processing data are needed. DATALUTA is certainly a step in the right direction. Of all the land occupations that happened between 2000 and 2011 in Brazil, the MST participated in no less than 50.2% and CONTAG in, at least, 10.4%. Thus, 62.9% of all land occupations in the country were primarily organized by these two movements , and that is why this paper has dedicated a separate subsection for the two movements mentioned above. Therefore, despite the abundance and proliferation of representative entities that aim to mobilize peasants and supporters on a variety of activities in order to decentralize land tenure and achieve land distribution in the country, the majority of occupations and most landless peasants are under the leadership of few groups. Of a total of 682,629 families that took part in land occupations between 2000 and 2011, 64% were mobilized by the MST followed by CONTAG, with 8.2%. Table 1 shows 6 different entities, the number of occupations and families involved with them during the analyzed period, as well as the respective percentages. Although land occupations garner great visibility, there are many other activities organized by these social movements that also draw attention to the issue of lack of access to land faced by a great number of peasants. Among these participatory strategies are: camping in relevant localities; solidarity actions; petitions in favor of the cause; hearings with authorities; road blockages; registration of interested parties; marches; religious celebrations; siege of construction sites; concentration in public spaces; meetings; strikes (including hunger and thirst strikes); access bans; manifestos; task forces; occupation of bank branches; occupation of public and private buildings; leafleting; vehicle retentions; pilgrimages; looting; thematic demonstrations; vigils; among others. The amount of participants involved reflects the relative level of impact and media coverage these activities receive. Consequently, there is a greater possibility for a favorable public opinion towards land redistribution. Therefore, not only potential beneficiaries, but urban supporters also can (and actually do) join the masses in these events. Many times these activities take place in large urban centers to form public opinion and mobilize supporters other than those directly involved in the struggle for land. Scholars, students and union workers are some of the potential targets to raise support and serve as a force in forming public opinion and pressuring decision makers on issues related to agrarian reform and land redistribution. The media’s approach and coverage also plays a relevant role in mass mobilizations. As shown in Table 2, in the twelve-year period (2000–2011) analyzed, over five million people participated in these mobilization activities as a strategy to pressure decision makers. This number does not include those who were not registered or counted, which would potentially increase the total figure. Also, people can participate in more than one kind of activity. Therefore, the final number should be interpreted not as the total number of different people involved in actions, but the total number of overall participants. The most popular activities that mobilized a substantial number of participants were: pilgrimages; concentration in public spaces; road blockages; thematic demonstrations; marches; camps; and walks. Table 1. Different manifestations aimed at attaining visibility to the struggle for land, 2000–2011. Table 2. Different manifestations organized to gain visibility for the struggle for land, 2000–2011. Of the 7,610 events registered in these twelve years, the MST participated in 3,305 (43%). This movement is exceptional at mobilizing rural workers. Supporters of their cause tend to organize on the national and international levels—the MST provides training to Latin American peasants and exchanges knowledge with different organizations in the field, such as the Bolivian MST and La Via Campesina. The CPT is one of the most important entities that support the struggle for land distribution, mobilizes peasants, and also provides legal and social assistance. The CPT participated in 935 mobilization activities; the Brazilian Movement of People Affected by Dams (MAB) participated in 446 mobilizations; the Rural Workers’ Union (STR) took part in 291 activities; the Federation of Agricultural Workers (FETAGRI) participated in 210 activities; and the Confederation of Agricultural Workers (CONTAG), in 109 mobilizations. Contrary to the occupations’ figures, CONTAG had a much more restrained participation. It is important to note that several of these actions were jointly organized by more than one of these entities. Figure 1 presents data on the number of demonstrations and participants in a compact and overlapping manner, showing fluctuations and indicating a trend. The changes in both the number of demonstrations and the number of family participants are cyclical. On presidential election years (2002, 2006 and 2010) in which a candidate from the Workers Party (PT) had real chances of winning (and in fact, they won all three elections: Lula won in 2002 and 2006, and Dilma Rousseff won in 2010) , there was a significant reduction in activities. The exception was 2010, with a slight increase in the number of demonstrations and participants. This was probably to the benefit of the PT candidate and did not influence negatively the party’s support given it has the most affinity to land distribution issues. The year 2010 was the third time a presidential candidate from the PT was running for office with real chances to win, and the results of a tiny agrarian reform and dissatisfaction with that policy could impact demonstrations against the PT government by agrarian reform supporters. However, the actual figures on the number of settlements created during the two terms of President Cardoso do not differ considerably from those created during Lula’s two terms. Both, the Brazilian Social Democratic Party, PSDB (Partido Social-Democrata Brasileiro) and the Workers’ Party, PT (Partido dos Trabalhadores) achieved advances for the rural population with progressive public policies. However, they both chose to carry out a conservative land reform greatly benefiting agribusiness instead of reducing inequality in the countryside. The result was more land concentration and less income for the poor rural population , expanding areas for sugarcane (for the production of ethanol) and soybeans intended for agribusiness. There was an increase in the number of victims of land conflicts both among peasants and agribusiness industrial farmers . Alongside mobilization activities aimed at communicating demands to Brazilian society and decision makers, land occupations are strategically planned to rouse Government intervention and accelerate the process of agrarian reform. Therefore, the following figure (Figure 2) shows the dispersion of land occupations organized by social, religious and union movements. Figure 2. Number of demonstrations and participants, 2000–2011. Source: Based on . Figure 3. Number of land occupations and people involved, 1988–2011. Source: Based on . Data is available as of the year of the promulgation of the new Brazilian Constitution, in 1988, when the social function of the land became an intrinsic part of mobilizations surrounding the issue of agrarian reform, encouraging groups of landless rural workers to occupy primarily private land provided it was unproductive. The same fluctuations can be observed both on the number of occupations and the number of people involved in them. Similarly, in election years when a candidate from the Workers Party (PT) had a real chance of winning (2002, 2006 and 2010) the number of occupations and of participants dropped. The opposite occurred in previous election years, 1994 and 1998, when Cardoso was the front-runner candidate and subsequently won. This indicates that there is political coherence in the movements participating in the struggle for agrarian reform, although in absolute numbers, as previously mentioned, the number of settlements achieved does not differ drastically. During the eight years of the Cardoso administration, 584,655 families were settled, compared to 614,093 settled families during Lula’s two terms ( p. 46). Yet, the available area for these settlements was significantly larger in the PT administrations, demonstrating the party’s affinity for agrarian reform. However, in terms of governance, when alliances are not always ideologically coherent, it is more difficult to implement land redistribution policies that benefit poorer peasants. Among members of Congress, the so-called Rural Caucus (Bancada Ruralista) was formed to advocate privileges for large landowners and oppose the agrarian reform. These politicians belong to different political parties and many were in the governing coalition during Cardoso’s, as well as Lula’s and Dilma Rousseff’s administrations. This suggests a voting ambiguity on issues relating to land distribution and agricultural activity in both houses of the Brazilian Congress. To illustrate this idea, in the 1994 and 1998 elections there were about 150 congressmen forming the Rural Caucus. Its ideological scope ranged from right to center-left, which made land redistribution in the country politically unfeasible ( p. 164). This can be considered a great obstacle in achieving fairer land distribution in the country. Both mobilization activities and land occupations organized by civil society entities encumber participants’ involvement in order to receive a plot of land, which, in the end, is nothing more than selective incentives ( p. 51) to participate in this risky endeavor. With the risks involved in collective action of this kind, Figure 3 shows the number of peasants and supporters killed over issues pertaining land dispute. This figure includes participation in mobilization activities organized by social movements. The data confirms that participation in the struggle for land can result in death, as illustrated by data from the CPT. An interesting fact observed in the data is that, after 1988 (when the democratic regime came into effect in Brazil) the number of killings over land disputes was significantly reduced. The year coincides with the promulgation of the 1988 Constitution, which transformed agrarian issues and facilitated expropriation in the case of unproductive land and non-compliance with the social function as described in the document. During the first three years of the democratic regime (1985–1988), the number of killings over land disputes was huge. The new Constitution may have played an important part in changing this, influenced by additional factors, such as the emergence and strengthening of social movements. That is, from that year on, there were laws that benefited disadvantaged rural groups by favoring land distribution and expropriations by compensating landowners in case the land did not comply with the minimum production standards. Moreover, non-governmental organizations that were legally supported by the Government advocated for the peasants’ interests, providing attorneys, land surveyors and other available assistance. Therefore, the peasants were no longer alone against large landowners and were increasingly aware of the laws and strategies to legally acquire a plot of land, although they often gave the impression of civil disobedience by occupying land that belonged to others. Despite the decrease, killings over land dispute continue to happen, even though the number has been stable since the promulgation of the 1988 Constitution. Violence ensues and peasants are being killed and suffering numerous human rights violations as a result of the struggle for land redistribution. It has been stated that several mobilization activities of the poor rural populations are carried out by organizations that seek agrarian reform. The occupation of unproductive land, which in part  is consistent with the law, is one of the strategies that achieve the greatest impact. Figure 4. People killed over land disputes, 1985–2011. Source: Based on . In 2003, there was an abrupt increase in the number of people that died as a result of land conflicts. It was in the beginning of Lula’s first term in Office. This hike in the number of deaths caused by land conflicts can be interpreted as a result of the peasants’ and their supporters’ high expectations generated by the workers’ party assuming the Federal Government for the first time. Consequently, there is an explicit increase in land conflicts because the peasants and smallholders understand that the government is on their side and that it can finally implement the agrarian reform more vigorously. Concurrently, the large landowners and agribusiness entrepreneurs are willing to defend their territory and, thus, more deaths result from these clashes. Given these extreme demonstrations and the risk to human life pertaining to the struggle to access land for peasant subsistence, how are these inputs being translated into outputs? That is, do land occupations and other mobilization activities result in a higher number of settlements? Figure 4 shows the number of implemented settlements since the promulgation of the new Constitution in 1988 to the present day. The lines representing settlements and settlers follow the same direction as the previous figures, also showing an important relation to election years, starting on the year of the new Constitution. By placing Figures 1, 2 and 4 side by side and comparatively analyzing them as if they were a temporal combination, that is, as fitting in pre-determined goals, culminating in an agrarian reform and in fairer and less unequal land distribution, they all meet the movements’ purposes of social justice for peasants. Figure 5. Number of settlements and settlers, 1988–2011. Source: Based on . That is, in election years when the Left had realistic chances of winning the presidential (re)elections, the number of mobilization activities, along with land occupations resulting in settlements, was greatly reduced. On other occasions, the number in each of those categories increases, including the figures on land occupation and settlements in election years when the chances of a Center party candidate winning the Presidency were higher. Overall, the activities and strategies of the social movements to optimize land distribution in democratic Brazil are coherent and the results are consistent with mobilization activities. Therefore, what does this progress mean in terms of land redistribution? This cannot be referred to as agrarian reform, because it is forced by land occupation and other activities that pressure authorities. It is not a planned agrarian reform, executed without pressure from the public opinion and avoidance of further bloodshed. By analyzing Table 3, it is observed that there was a quantitative leap in the two terms of the Cardoso and Lula administrations compared to previous governments with regards to land redistribution in Brazil. In the two terms of President Cardoso’s administration there were 4,310 settlements created, while 3,602 settlements were created during the eight years of Lula’s administration. However, the extension of settlements increased during Lula’s government; while a smaller number of families were settled, the area size per family was much larger. This allows both for subsistence and trade to take place in the establishments . We have to differentiate two terms used in the international literature, which are not applied in the Portuguese and Spanish languages for lack of the expression “Land Reform”, but only Agrarian Reform. Thus, there is confusion in the discussion of the agrarian issue in Latin America. Agrarian reform generally embodies land reform as its most important element. “Agrarian reform includes both redistributing land and assisting new landowners by assuring them inputs and markets, extending credit and imparting certain technology that will help them to become agricultural producers” ( p. 12). Of prime importance is the rural credit and technical knowledge. Peasants and peasants’ cooperatives in possession of newly acquired title lands can accomplish little, if anything, without access to adequate financial resources, enabling them to purchase seeds, stock, tools, fertilizers, pesticides, etc. and install water supplies in some cases. Therefore, the Lula administration’s larger average-sized settlements do not imply more quality than those of previous administrations. Nonetheless, given data restrictions, it is not possible to analyze land fertility or infrastructure elements such as access to schools, electricity, roads, medical services, and so on. Violence over land disputes has dramatically decreased when coupled with land redistribution. When there is real distribution to families who need it most, it enables productivity, and these families leave the poverty line, reducing the pressure for survival and for land disputes. Table 3. Results in land distribution relating to agrarian violence in democratic Brazil. Source: Based on  and . While during the Sarney administration there was one person killed for every 5 settlements created, in the Collor/Franco administration there was one person killed for every 7 new settlements. In the Cardoso administration, out of every 64 settlements, one person was killed over land disputes, and during Lula’s government, the number was 46 new settlements per one killing over land disputes. That is the price paid in human lives to implement a public policy that is necessary to the survival of the peasantry, especially of the poorest. As more settlements are created, the tension between agrarian sectors over land acquisition decreases, as it allows more people to support themselves by farming their own land. In terms of agrarian policy, the ineffectiveness of the State must be considered, regardless of which government currently holds office. According to data from NERA, there is a disparity that stands out between the number of families each settlement could hold and the number of families actually placed in these settlements. That is, in the twelve-year period observed in this study (2000–2011), 496,368 families could have been placed in the created settlements. However, the actual number of settled families was 366,621, or a 26 percent underperformance. This figure is not negligible, and could even improve the performance of the State with regards to civil society’s demands for agrarian reform. What can be inferred from the data presented in this study is that violence in rural Brazil is derived from a lack of political interest to carry out land reform and achieve a more equitable distribution by the different levels of Government, which would correct mistakes of the past and break the vicious cycle the country has been dwelling in for centuries. Rural Brazil, unlike its urban counterpart, is lagging, as cronyism prevails and laws are not respected , leading to a struggle between the strongest and the dispossessed. Extreme inequality among people creates insurmountable social chasms and requires state intervention to be repaired. The Brazilian State always favors large landowners and agribusiness. Democracy has ushered the freedom of individuals to be affiliated to social movements and allowed for their representation in State institutions. It has also retrieved citizenship for most of the poor, as well as bolstered the struggle for a more equal country where everyone can have the minimum to survive. Brazil is far from enabling everyone to live a decent life and from being able to support all of its citizens during times of social and economic hardships. However, as presented, there have been significant advancements for the poorer sectors of the population living in rural areas in the past two decades. Brazil was the 7 t ⁢ h world economy in 2012 , but ranked 81 s ⁢ t in per capita income , which means that the country is rich, but the majority of the population is poor. Due to the country’s size, there is still much to be done, and inequality must be reduced. Land concentration in the hands of a few former plantation owners, who are currently operating in agribusiness, allied to a financial sector, which invests in agriculture, requires State action. It is understandable that strong interest groups have put considerable pressure to increase the amount of land destined to agribusiness in the country. However, democracy should serve all citizens, and allow the poor to raise their living standards in rural areas by giving them access to land. The best social program for peasants is a plot of land so that they can derive their own livelihood from their work. Certainly, the Bolsa-Família Program  helps the poor, but it has a temporary role to momentarily alleviate poverty. As long as it is supported by other public policy tools, like financing, agricultural capacitation, in addition to basic education, health and security services needed by all, access to land is the permanent solution for overcoming poverty. As evidenced by the increased number of rural settlements created by the State in the past two decades, the strategies used by social movements to achieve land distribution for low-income peasants have had a positive effect. There is still a lot to be done to repair this extreme inequality, but the first steps have been taken and are developing. The violence applied by large landowners and the reaction of the State towards the peaceful activities organized by social movements perpetuate the victimization of the peasants. In this sense, public policies to decrease violence caused by land disputes must be created, giving land to those that need it most. In order to avoid further bloodshed, agrarian reform must be a long-term commitment by the State, instead of belonging to this or that government at a given time in history. The ‘price’ of a peasant’s life in terms of new settlements is increasing and, today, as more settlements are created fewer peasants die as a result of land conflicts. However, the path to further reducing that ratio is long and difficult. Both the lack of State intervention in land disputes and/or the failure of the police to protect rural workers and landless people could be seen as reasons for peasants to die in agrarian conflicts in Brazil. More needs to be done in rural areas to defend the poor and enforce the law, advancing democracy for all in Brazil. I wish to express my sincere gratitude to the Land Project discussion group, headed by Wendy Wolford at Cornell University, where I spent twelve months during the academic year 2013–2014. I also thank FAPESP (São Paulo Research Foundation in Brazil), which gave me financial support during my stay at Cornell, and afterwards to present this paper at the International Studies Association (ISA) annual convention at Atlanta in 2016. Agricultural trade in 2012: A good story to tell in a difficult year? European Commission; 2013. Available from: http://ec.europa.eu/agriculture/trade-analysis/ map/2013-1_en.pdf. Wolford W. This land is our now: Social mobilization and the meanings of land in Brazil. Durham, NC, USA: Duke University Press; 2010. Clapp J. Food. Cambridge, UK: Polity Press; 2012. Paarlberg R. Food politics: What everyone needs to know. New York, NY, USA: Oxford University Press; 2010. Maystadt JF, De Luca G, Sekeris PG, Ulimwengu J. Mineral resources and conflicts in DRC: A case of ecological fallacy? Oxford Economic Papers. 2014;66(3):721–749. Rustad AS, Binningsbo HM. A price worth fighting for? Natural resource and conflict recurrence. Journal of Peace Research. 2012;49(4):531–546. Paivi L. The spoils of nature: Armed civil conflict and rebel access to natural resources. Journal of Peace Research. 2010;47(1):15–28. Basedau M, Lay J. Resource Curse or Rentier Peace? The Ambiguous Effects of Oil Wealth and Oil Depen- dence on Violent Conflict. Journal of Peace Research. 2009;46(6):757–776. Simmons CS. Territorializing land conflict: Space, place, and contentious politics in the Brazilian Ama- zon. GeoJournal. 2005;64(4):307–317. Ross ML. What do you know about natural re- sources and civil war? Journal of Peace Research. 2004;41(3):337–356. See the complete definition on Polity IV, available at http://www.systemicpeace.org/inscr/p4manualv2012. pdf. Ahmadov AK. Oil, Democracy, and Context: A Meta-Analysis. Comparative Political Studies. 2014;47(9):1238–1267. Vreeland JR. The Effect of Political Regime on Civil War Unpacking Anocracy. Journal of Conflict Resolu- tion. 2008;52(3):401–425. Collier P, Hoeffler A. Resource Rents, Gover- nance, and Conflict. Journal of Conflict Resolution. 2005;49:625–633. Hegre Tanja Ellingsen and Scott Gates and Nils Pet- ter Gleditsch H. Toward a Democratic Civil Peace? Democracy, Political Change, and Civil War. American Political Science Review. 2001;95(01):33–48. Conflitos no campo Brasil. Goiânia, Goiás, Brazil: Comissão Pastoral da Terra; 1985–2011. Available from: http://cptnacional.org.br/index.php/component/ jdownloads/viewcategory/43-conflitos-no-campo- brasil-publicacao. Based on interviews with the Land Pastoral Commis- sion (CPT)s attorney in November 2007 in the city of Marabá, state of Pará, Brazil. By the way, many details throughout this paper are based on several interviews the author gave on the ground to agrarian leaders. That is the reason why the quotes are not overused. The origin is actually historical. In the XV century, the Portuguese Crown, concerned with local production and tax collection, gave land to people for a period of time (sesmarias) so they would produce and pay taxes. This kind of production generated Plantations, which utilized slave labor in the Americas explored by the Europeans. This lasted until 1822, and originated the well-known latifúndio in the country. Violência rural no Brasil. Human Rights Watch - Amer- icas Watch Report; 1991. Borras Jr SM, Franco JC, Borras Jr SM, Franco, Bor- ras SMJ. Global Land Grabbing and Trajectories of Agrarian Change: A Preliminary Analysis. Journal of Agrarian Change. 2012;12(1):34–59. Hall A. Land tenure and land reform in Brazil. In: Prosterman, R L ; Temple, M N ; Hamstead TM, edi- tor. Agrarian reform and grassroots development: Ten case studies. Boulder, CO, USA: Lyenne Rienner; 1990. pp. 205–232. Hammond JL. Land Occupations, Violence, and the Politics of Agrarian Reform in Brazil. Latin American Perspectives. 2009;36(4):156–177. Feliciano C. O movimento camponês rebelde e a geografia da reforma agrária. [M.A. Dissertation]. Uni- versity of São Paulo, Department of Geography, São Paulo, SP, Brazil; 2003. Ondetti G. Repression, Opportunity, and Protest: Ex- plaining the Takeoff of Brazil’s Landless Movement. Latin American Politics & Society. 2006;48(2):61–94. Center of Studies, Research and Projects of Agrarian Reform (NERA) of the State University of São Paulo (UNESP). Dataluta: Banco de dados da luta pela terra. Presidente Prudente, SP, Brazil: UNESP; 2013. Available from: www2.fct.unesp.br/nera/projetos/ dataluta_brasil_2013.pdf. In this specific case, the MST trains the leaderships of neighboring countries. Additionally, the La Via Campesina movement, founded in 1994, is also active in Brazil. The movement is transnational and com- prises about 150 different peasant movements in ap- proximately 70 countries around the globe, represent- ing 200 million smallholder farmers. Fernandes BM. Re-peasantization, resistance and subordination: The struggle for land and agrarian re- form in Brazil. Agrarian South Journal of Political Econ- omy. 2013;2(3):1–21. Medeiros LS. História dos movimentos sociais no campo. Rio de Janeiro, RJ, Brazil: Fase Editora; 1989. Valente RR, Berry BJL. Countering Inequality: Brazil’s Movimento Sem-Terra. Geographical Review. 2015;105(3):263–282. Watanabe CH. Desenvolvimento rural sustentável solidário e a formação sindical: A experiência da CON- TAG. Raízes. 2010;29(1):166–173. Picolotto EL. Quando novos atores entram em cena o que muda? A construção da representação política dos agricultores de base familiar no sul do Brasil. Re- vista espaço acadêmico. 2008;91:1–7. CONTAG gasta R$1 milhão na organiza- ção do Grito da Terra. Diário do Grande ABC. 2000 May 10; Available from: http: //www.dgabc.com.br/Noticia/265486/contag-gasta-rs- 1-milhao-na-organizacao-do-grito-da-terra. Despite newspapers calling it land invasions, a more neutral term used by social movements is land occu- pations. Scherer-Warren I. The social movements’ politics for the rural world. Estudos, Sociedade e Agricultura. 2007;15(1):5–22. This figure can be even higher if partnerships between movements, which are common in many nooks in the country, were counted. Actually, Dilma Rousseff won both elections for presi- dent (2010 and 2014), but this paper does not cover the 2014 presidential election). Zimerman A. Land kills: The Brazilian experience. Population Review. 2012;51(2):41–58. Olson M. The Logic of Collective Action: Public Goods and the Theory of Groups. Cambridge, MA, USA: Harvard University Press; 1965. The “in part” is included because an occupation should not be performed before a procedural decision. How- ever, it is through these occupations that the State is pressured and the movement gains strength and requests prompt decisions to avoid greater loss and further deaths. Obviously the size of the area necessary for subsis- tence depends on various factors, such as cultivated crop, quality of the soil, irrigation, use of fertilizers and pesticides, climate, among others. Thiesenhusen WC. Broken promises: Agrarian reform and the Latin American campesino. Boulder, CO, USA: Westview Press; 1995. National accounts main aggregates database. United Nations; 2013. Available from: http://unstats.un.org/ unsd/snaama/dnltransfer.asp?fID=2. The Bolsa-Familia Program is an income-transfer pro- gram carried out by the Brazilian Federal Government, and was considered one of the most effective instru- ments to combat poverty, increasing access to educa- tion, which in itself reduces poverty in the medium and long terms. Table A1.Socio-territorial Movements and Brazilian States in which they operate (2000–2011).